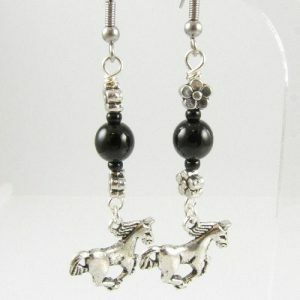 Horse earrings with black Moon AB beads – handcrafted with Tibetan silver flower beads, Black Moon AB beads and silver plated horse charms. They hang on surgical steel ear wires. 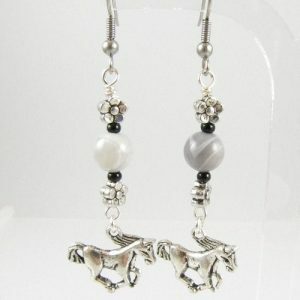 Horse earrings with Honey Jade beads – handcrafted with Tibetan silver flower beads, Honey Jade beads and silver plated horse charms. They hang on surgical steel ear wires. 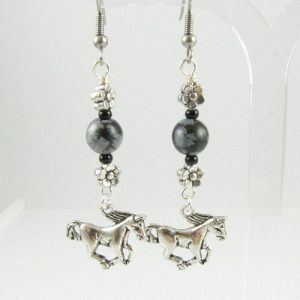 Horse earrings with Botswana Agate beads – handcrafted with Tibetan silver flower beads, Botswana Agate beads and silver plated horse charms. They hang on surgical steel ear wires. Horse earrings with Snowflake Obsidian – handcrafted with Snowflake Obsidian beads, Tibetan silver flower beads and silver plated horse charms.They hang on surgical steel ear wires. 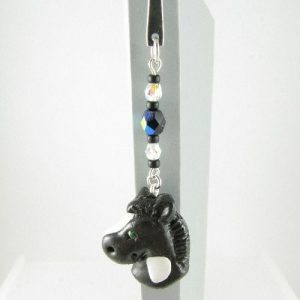 Horse necklace with Obsidian beads – handcrafted with a silver plated horse charm, silver plated leaf charms and Obsidian beads. 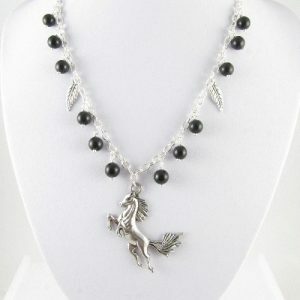 The charms and beads hang on a silver plated chain, which closes with a lobster clasp. 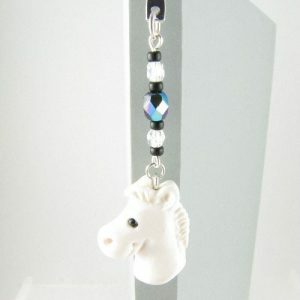 White horse bookmark – handcrafted with polymer clay in white, Japanese seed beads and fire polished Czech beads.The horse is attached to a silver plated bookmark. Flying horse charm bracelet with Golden Honey Jade beads. Handcrafted with a flying horse charm, leaf and hand charm and Golden Honey Jade beads on a silver plated chain.